Food Service Distribution in Wisconsin and Michigan | Merrill Distributing, Inc.
We provide quality products for restaurants, schools and institutions, bar and grill business, community festivals and social events with an ever-growing variety of food products. Check with Merrill Distributing first! As a member of Unipro Foodservice, we are committed to giving our customers a wide range of products to meet your needs. Why Unipro? 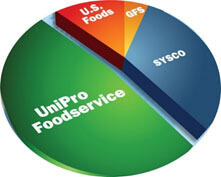 UniPro Foodservice, Inc. is the leading foodservice distribution network in the United States. With a collective sales volume of over $58 billion, the buying power of UniPro enables Merrill Distributing to receive enhanced purchasing opportunities, and as a result provide better pricing, and a vast array of products to our customers. First introduced in 1966, the CODE label has provided over 30 years of consistent quality foodservice products. CODE high quality comes from thorough product specifications, plant inspections and regular quality assurance checks. Quality, variety, integrity and commitment are the cornerstones of the CODE label family of food products, each recognized throughout the food industry as superior products. The CODE label is available in popular sizes utilized in the foodservice community. We provide quality produce for food service and retail convenience stores. We service restaurants, schools and institutions, bar and grill business, community festivals and social events. More details are available at our produce webpage.